About a month ago Zeus and I went to the Mütter Museum. I'd been there a few times, but it was new to him. He loved it! There's all kinds of fascinating/gruesome stuff there, but the skulls always make the biggest impression on me. 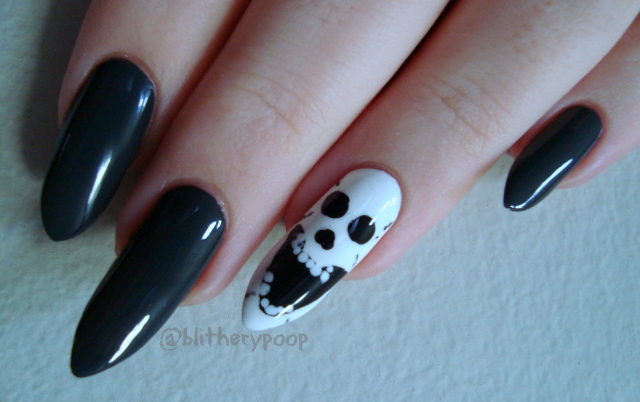 The idea of skull nail art has been bouncing around in my head ever since. Once I sharpened my nails I knew what to do. It just took me a while to actually do it. Confession...nail art makes me really nervous! I usually do practice runs for new ideas, but this time it worked on the first try. 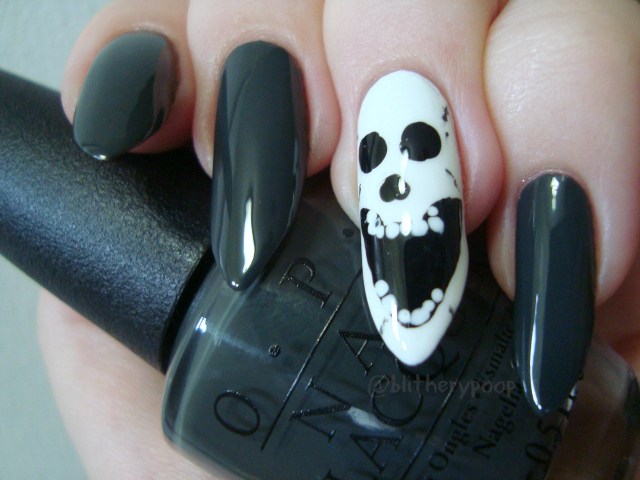 The base white is Sally Hansen OMGhost and the black detail is Night Fright. I did the eye sockets and nasal opening with the biggest dotting tool I have, then outlined and filled in the mouth with a tiny angled brush. I used the tiniest dotting tool to do the teeth with OMGhost and then added faint ridge details with Night Fright and an almost dry brush. The other nails are OPI Nein! Nein! Nein! OK Fine. I still can't believed it worked! Wow, I thought it was a nail wrap, great job!